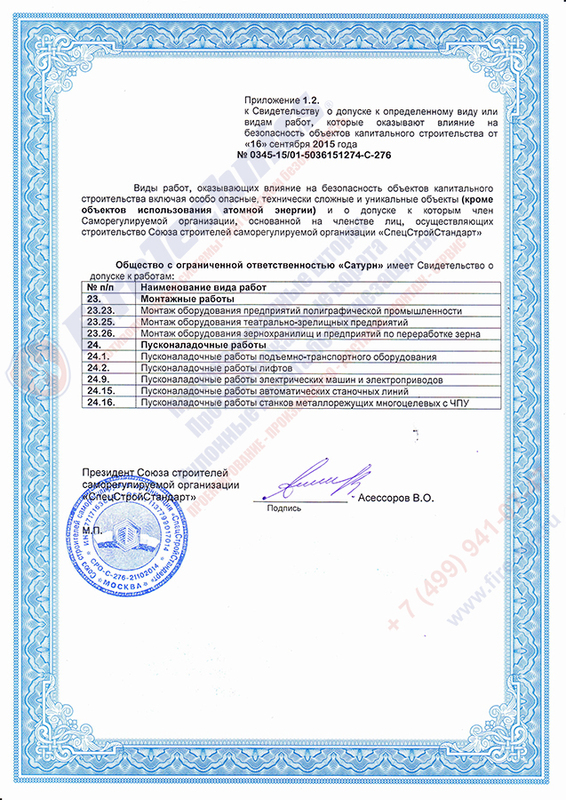 This Certificate, received in September 2015, confirms the admission of FireTechnics specialists to works that affect the safety of capital construction facilities – their list is detailed in the attachment. Among them, installation works – installation of prefabricated, metal and reinforced concrete structures, installation of equipment – elevator, lifting and transport, thermal power plants, filling and hydroelectric stations, enterprises producing building and industrial goods, gas stations, boiler houses, textile, paper and other enterprises Products, etc., work on fire protection of pipelines, building structures and equipment. 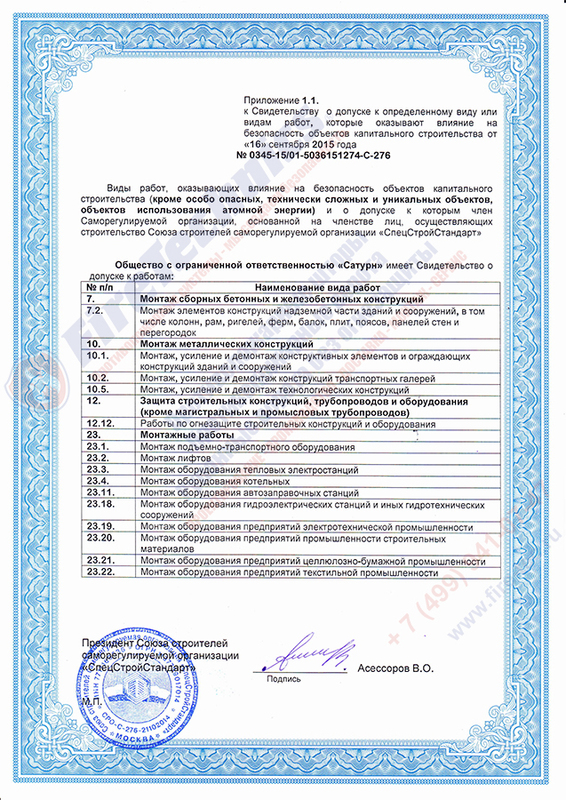 In addition, this certificate allows the company to perform commissioning and repair work of electric drives, hoisting and transport equipment, elevators, automated machine lines, etc. 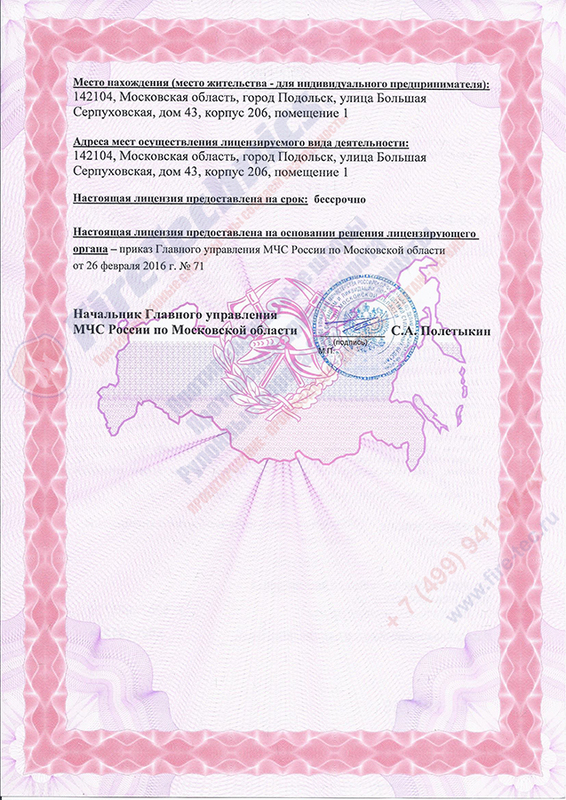 The license to carry out the installation, maintenance and repair of fire safety equipment for buildings and structures was received by the company in February 2016. 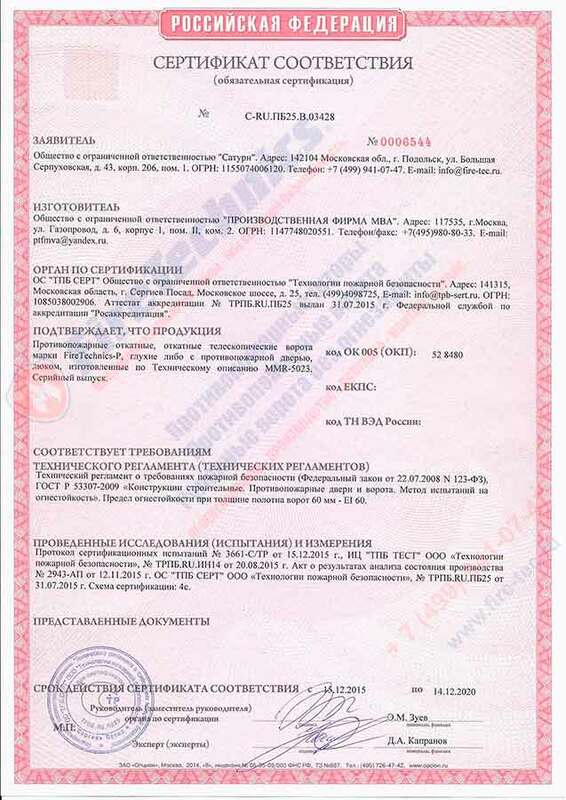 It confirms the legitimacy of the services provided by Fire Tecnics in the field of fire safety in various buildings and facilities, the list of which is listed in the annex to the document. 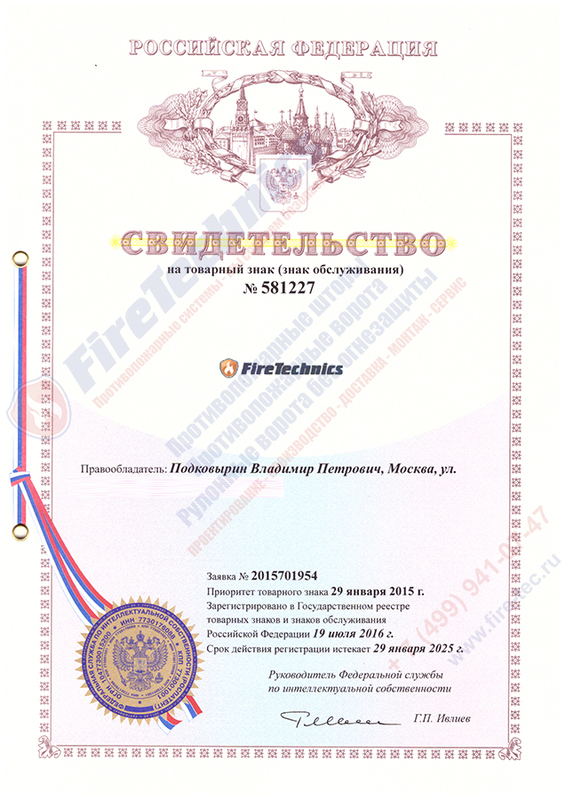 The certificate of registration of the trademark FireTechnics was received by the company on January 29, 2015. It allows you to protect the company’s products from forging, give it individuality, make it more recognizable to customers and promote it in a civilized way in the target market. 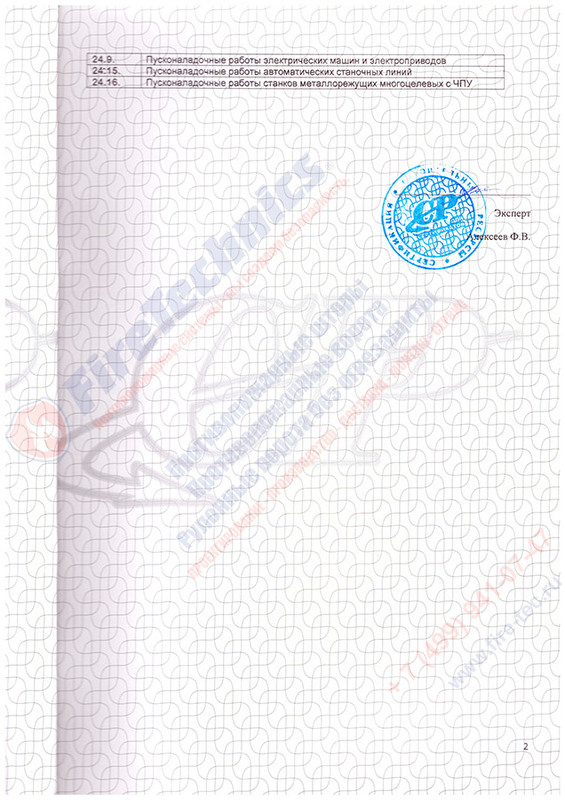 The FireTechnics trademark is a symbol of the impeccable quality of products offered by the manufacturer to consumers. It means that the company’s products comply with the national quality standards, emphasizes the high status and seriousness of the company that cares about its reputation and will not allow attackers to stain their name with a counterfeit offer under a recognizable brand. The presence of an ISO certificate of compliance with the company indicates that the quality of its fire-fighting systems is aligned with current international standards. Our customers and partners trust us, and we, in turn, continuously optimize production technologies, innovate in the field of fire safety, rethink financial flows, increasing the potential for further development and improvement of product quality. 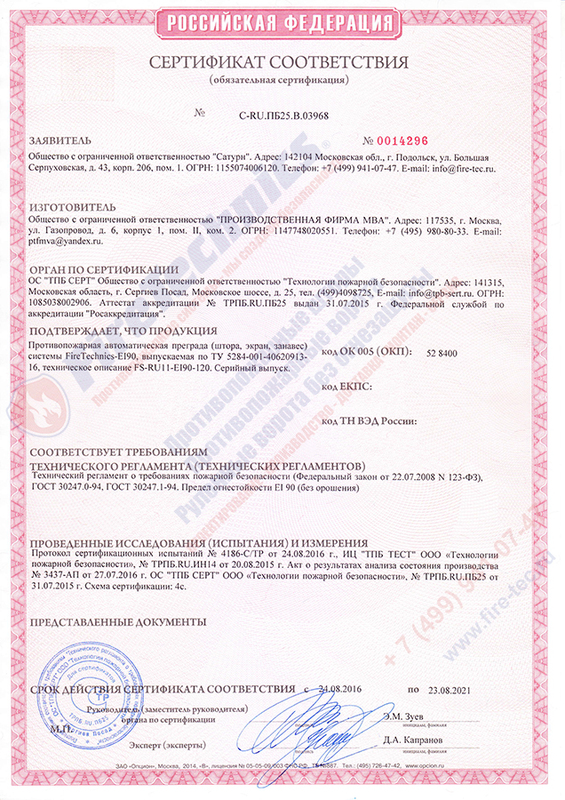 The application to the certificate ISO 9001 includes the enumeration of the types of works on construction, reconstruction and repair that affect the safety of capital construction projects, which are carried out by the company’s specialists at the European level of quality. 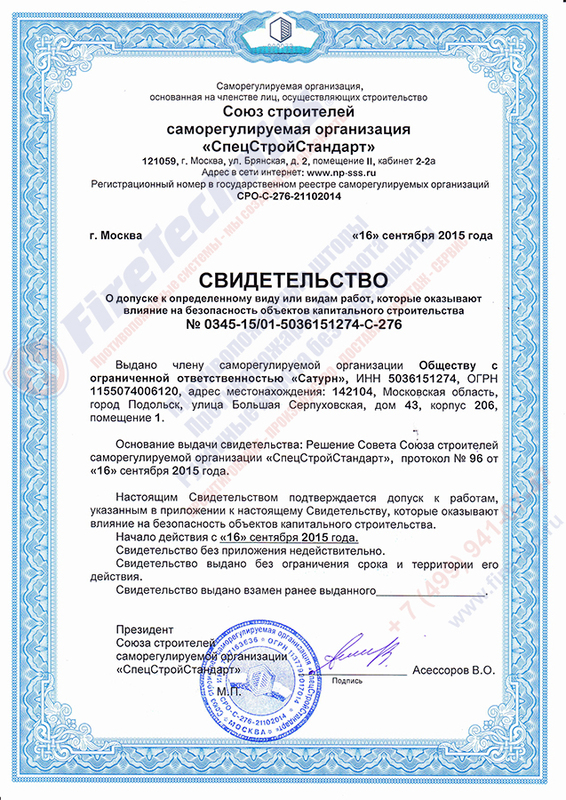 This mandatory Russian certificate of the state of production confirms that the block of fire control equipment manufactured by the company complies with the requirements of the technical regulations on fire safety requirements and is of the highest quality. Due to this, it can be used without restrictions for the installation of fire safety systems in industrial, entertainment, public, agricultural and other enterprises and facilities. 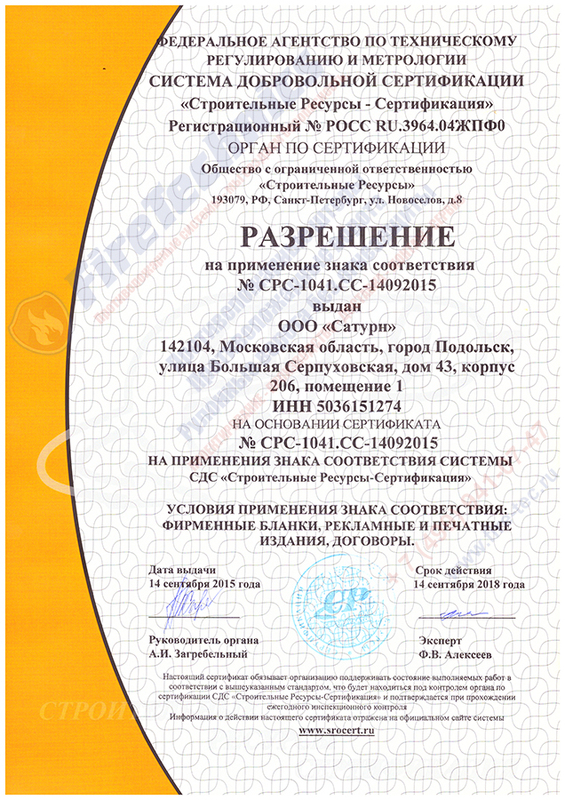 The certificate of conformity for sliding fire-prevention gates with a door-loophole or without it is made in accordance with the regulations of the technical regulations on fire safety requirements, and also taking into account the requirements of federal law No. 123 approving the order of tests of door and portal structures for fire resistance. During the practical tests, the manufacturer’s gate proved its high fire resistance EI 60 – the ability to restrain the fire element from sprawling through the building for 60 minutes. The certificate for sliding and fireproof gates, both equipped with a door (hatch, loophole), and without it, confirms that they are manufactured in accordance with the technical regulations on fire safety requirements and Federal Law No. 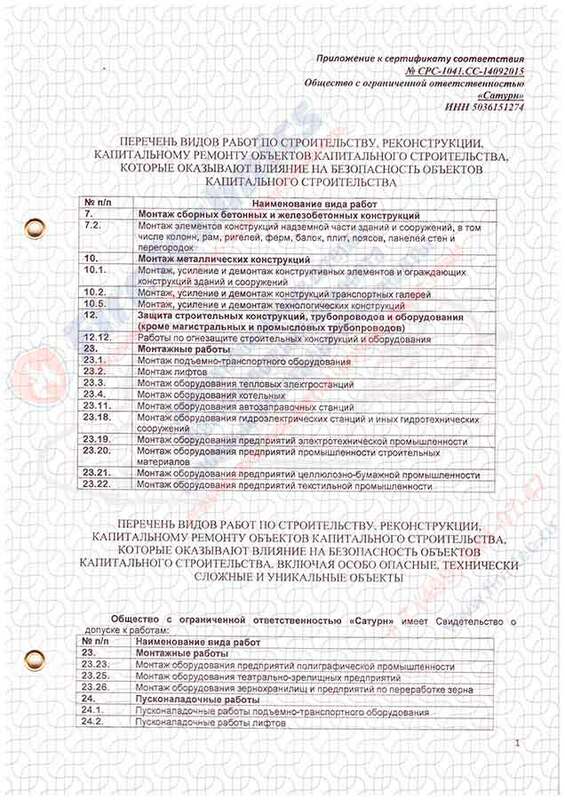 123, which approves the order of tests of portal structures for fire resistance. In the course of practical tests, these gates of the manufacturer confirmed the increased level of fire resistance EI 90 – the ability to curb the spread of fire throughout the building for 90 minutes. 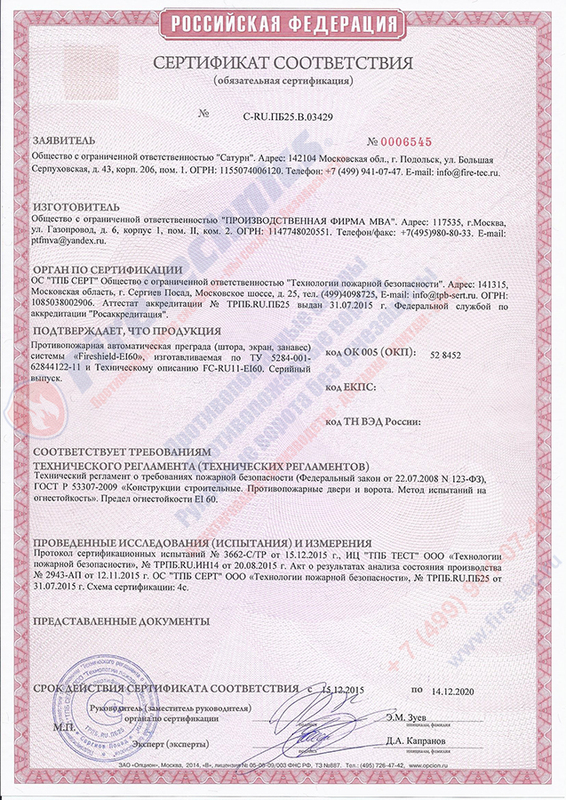 This certificate of conformity confirms that the manufacturer’s rolling gates are of high quality and fully comply with the standards reflected in GOST R documents 52502-2012. 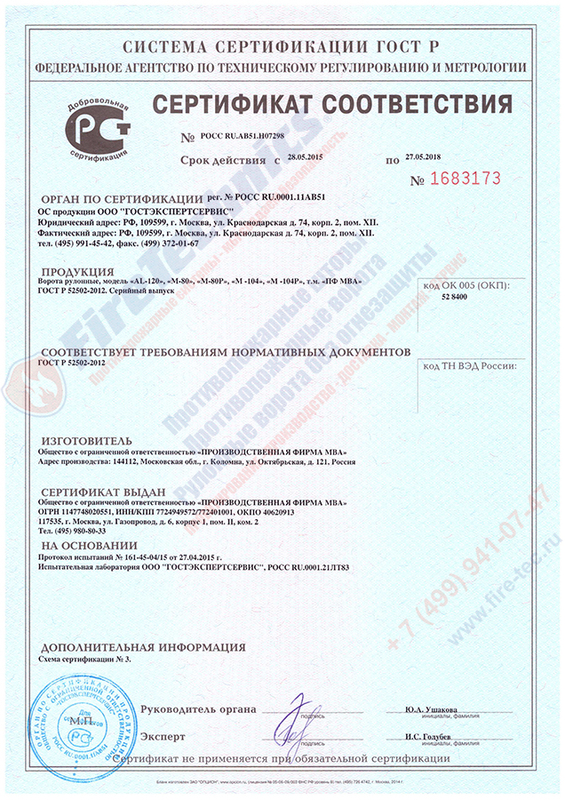 The certificate for Firerollgate EI-60 roll-up rolls with filler – mineral wool, having fireproof qualities, indicates that these products of the manufacturer comply with the standards of the technical regulations on the production of flame retardant products, and are tested in accordance with GOST 53307-2009 (contains provisions for the testing of structures On fire resistance). The tests carried out confirmed that the Firerollgate EI-60 gate is capable of delaying fire and smoke spreading for 60 minutes. 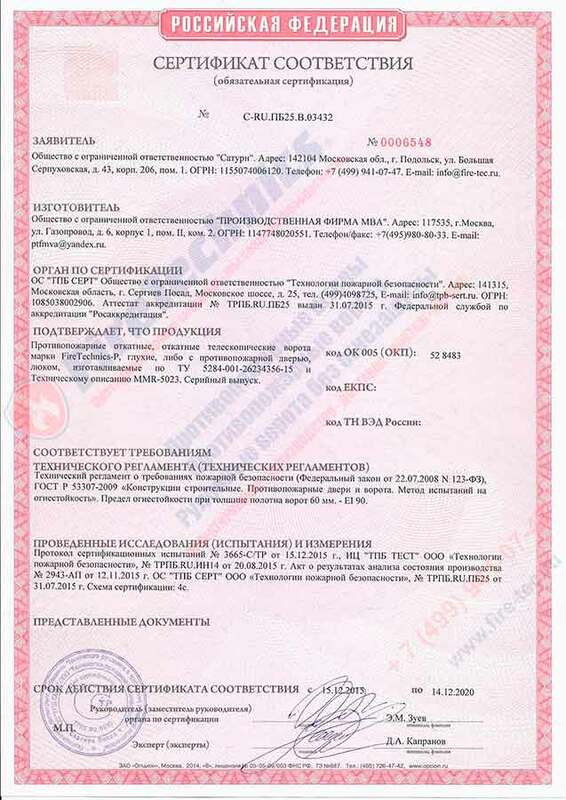 The certificate for Roller Gate Firerollgate EI-60 with intumescent filler and fire protection confirms their compliance with the requirements of the technical regulations reflected in Federal Law No. 123. During the tests in accordance with GOST 53307-2009 (describes the methods of testing for fire resistance) it was confirmed that the manufacturer’s steel rolling gates are capable of delaying fire and smoke spread on the claimed 60 minutes by the manufacturer. The certificate of conformity for FireTechnics-S sectional fire gates EI-60 confirms that they comply with the requirements of the technical regulations on fire safety requirements in the framework of GOST R 53307-2009 and have fire resistance limit EI 60. This indicator indicates their ability to contain fire and smoke spread from the hearth Fires throughout the building for 60 minutes. This time is quite enough for carrying out the evacuation of people, saving material assets and the arrival of a fire brigade. The certificate for Fireshield E-120 smoke curtains without irrigation, which can have a height of up to ten meters and is designed for smoke removal to the smoke removal systems of combustion products, indicates that they are in accordance with the technical regulations on the production of fireproof structures and passed practical tests in accordance with GOST 53305-2009 . In the course of the latter, they confirmed the ability to create a “trap” for the fire of heavy smoke, not allowing it to creep across the room for a hundred and twenty minutes. 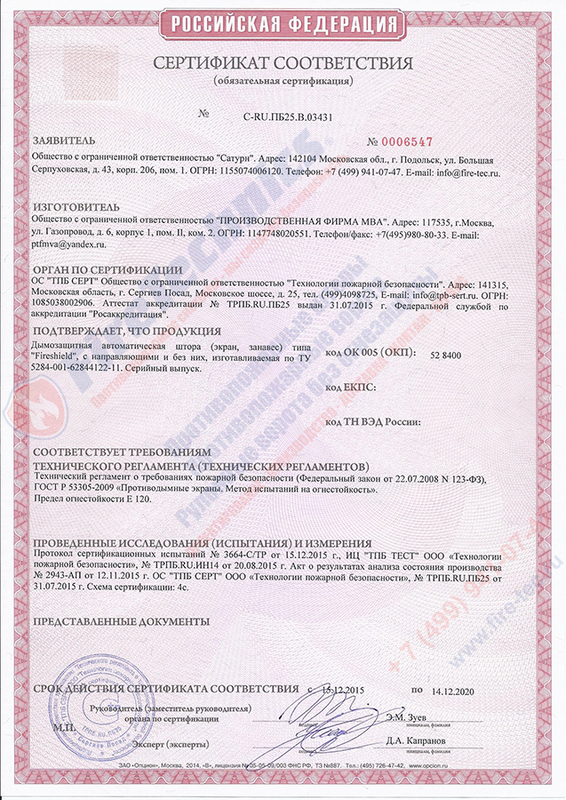 The certificate for fire protection blinds Fireshield EI-60 without irrigation, received on December 15, 2015, confirms that the products of the company intended for smoke removal and removal to smoke removal systems cope with their duties, as required by Federal Law №123. In addition, the certificate reflects the results of practical tests in accordance with GOST 53305-2009, which proved the ability of fireproof barriers to block “heavy” smoke, preventing its spreading through the room, within sixty minutes. 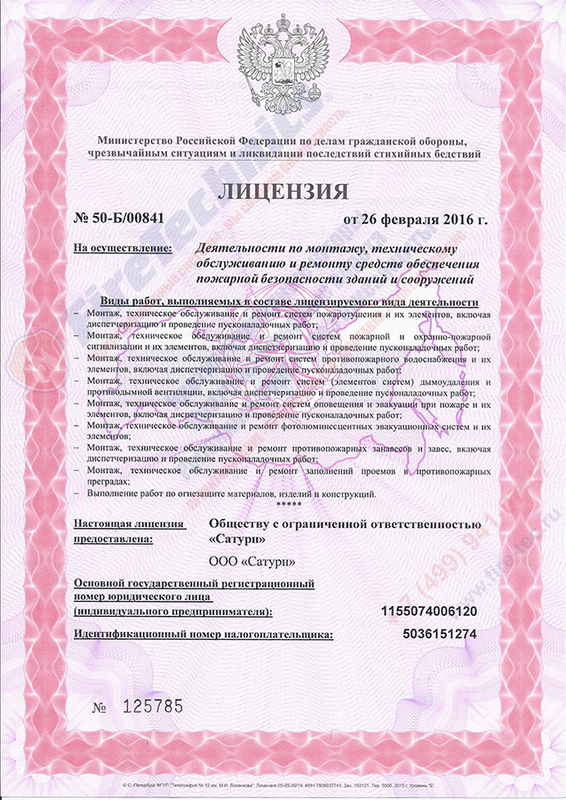 The certificate for fire curtains Fireshield EI-60 with irrigation, which can be supplemented with a door-loophole, or go without it, received on January 25, 2016, confirms that products designed for fire and smoke containment with unilateral water irrigation from splinker or deluge systems Have passed practical tests, according to GOST 30247.0-94, GOST 30247.1-94. During the tests, their ability to hold fire and “heavy” smoke for sixty minutes was confirmed. 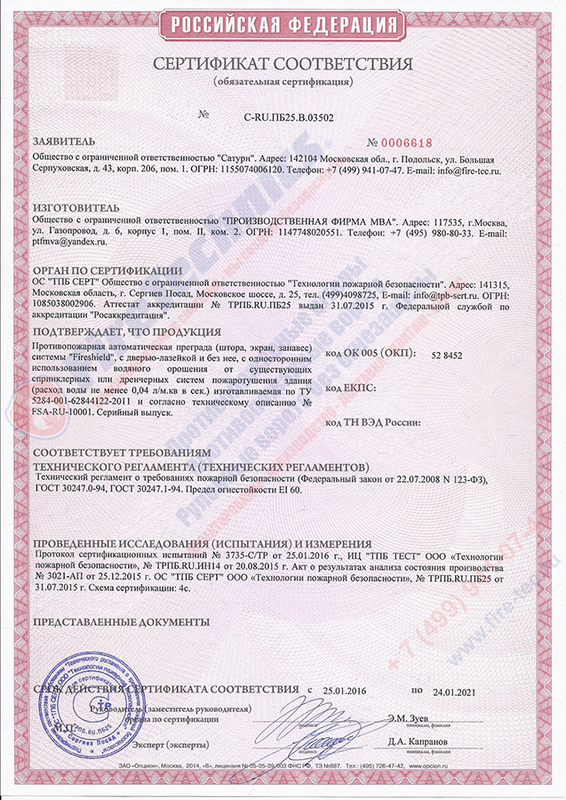 The certificate for Fireshield EI-120 fire curtains with irrigation that can be supplemented with a door-loophole, or delivered without it, received on December 15, 2015, confirms that products intended for fire and smoke protection, provided with one-way water irrigation from splinker or Deluge systems meet the requirements of the technical regulations of the Federal Law 123 and passed practical tests, as specified in GOST 53305-2009. These tests confirmed that these fire barriers can curb the spread of the fire for a hundred and twenty minutes. 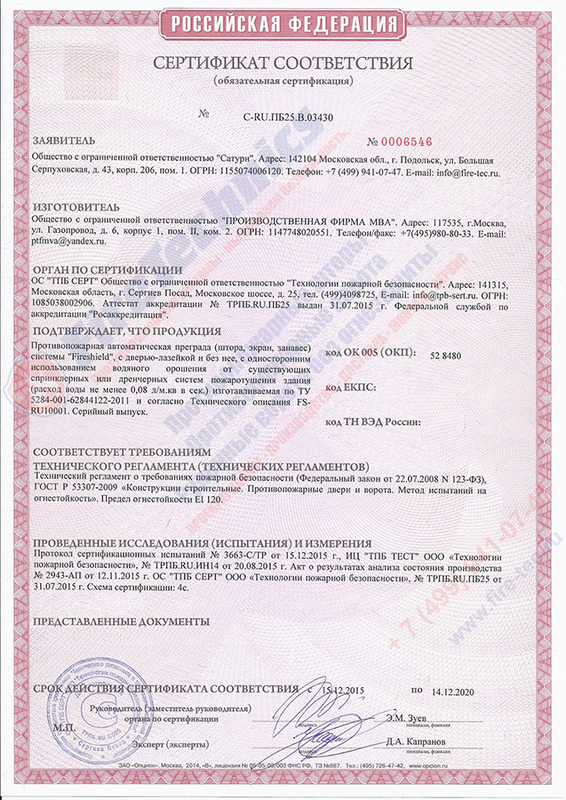 The certificate for fire curtains Fireshield EI-180 with unilateral irrigation dated January 25, 2016 confirms that the fireproof barriers of the company, supplemented with a door-loophole or ordered without it, and intended for fire and smoke retention meet the requirements of the technical regulations described in the Federal Law 123. In addition, they passed practical tests under GOST 53305-2009, which confirmed that they are able to delay the spread of the fire within one hundred and eighty minutes. 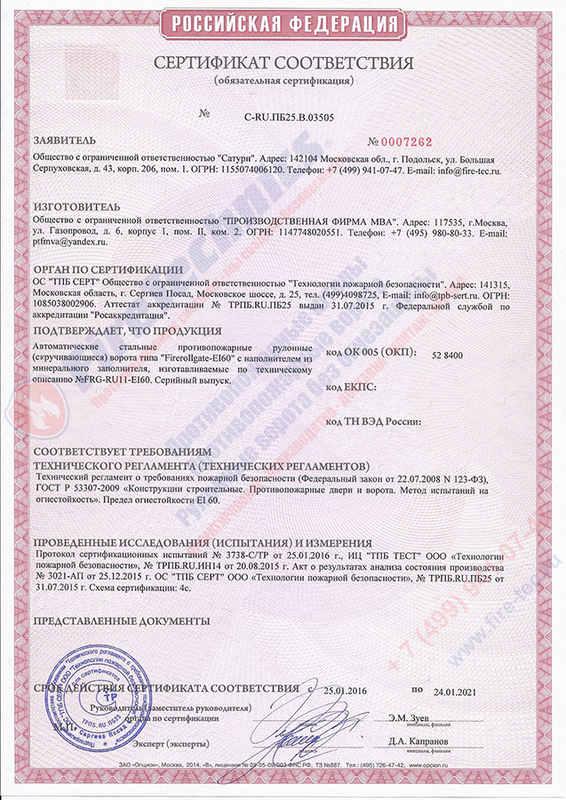 FireTechnics EI90 fire protection certificate (without irrigation), received on August 3, 2016, confirms that the products intended for fire and smoke protection meet the requirements of the fire safety regulations set forth in Federal Law No. 123. They successfully passed the tests in accordance with GOST 30247.1-94, the results of which confirmed their ability to fire and smoke retention for ninety minutes. 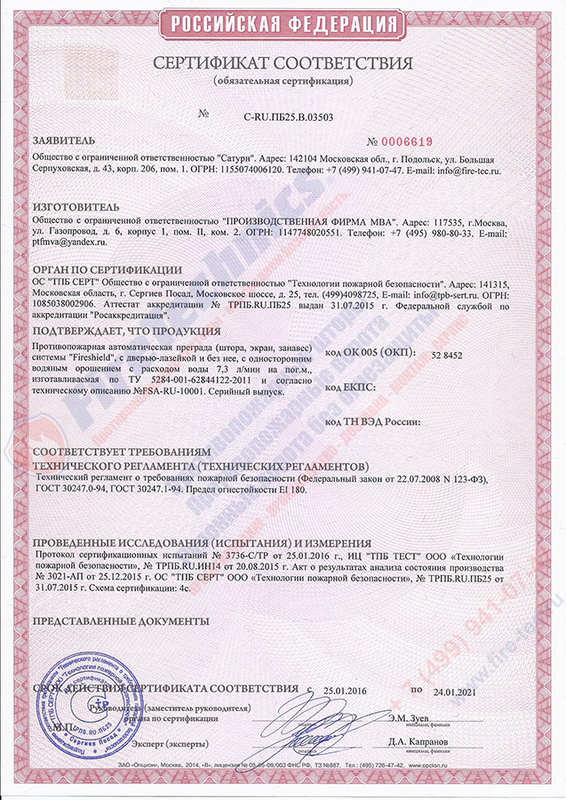 FireTechnics EI120 fire protection certificate (without irrigation, received on August 24, 2016, indicates that these automatic barriers for fire and smoke retarding are manufactured by the company in accordance with the requirements of the fire safety regulations Federal Law No. 123, as well as those specified in GOST 30247.0-94 and GOST 30247.1-94 As a result of the tests, the manufacturer’s claimed ability to curb the spread of fire on the building for one hundred and twenty minutes was proved, which is more than enough to conduct evacu tion of people and property. The group of companies FireTechnics closely monitors that all products have certificates of conformity. This confirms our desire to produce high-quality products in the field of fire barriers. The FireTechnics group of companies possesses the necessary certificates of admission to certain types of work that affect the safety of capital construction facilities. 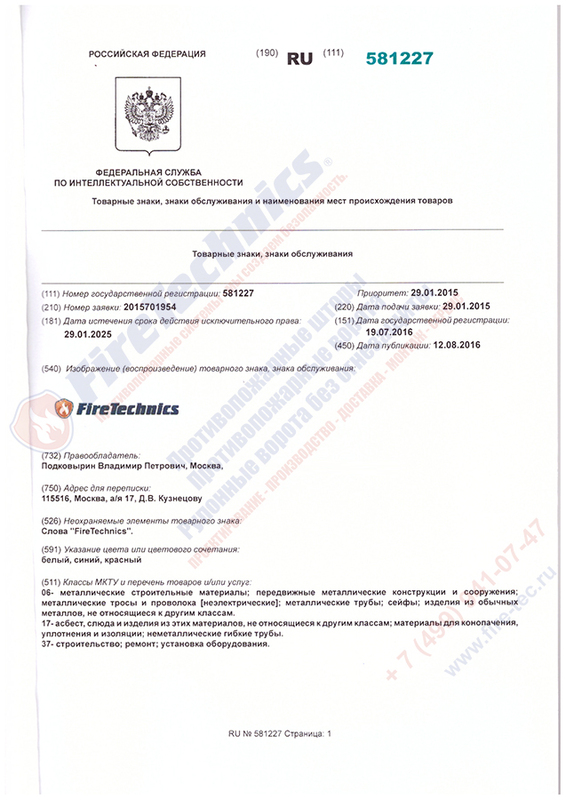 The group of companies FireTechnics has a license to carry out activities for the installation, maintenance and repair of fire safety facilities for buildings and structures. 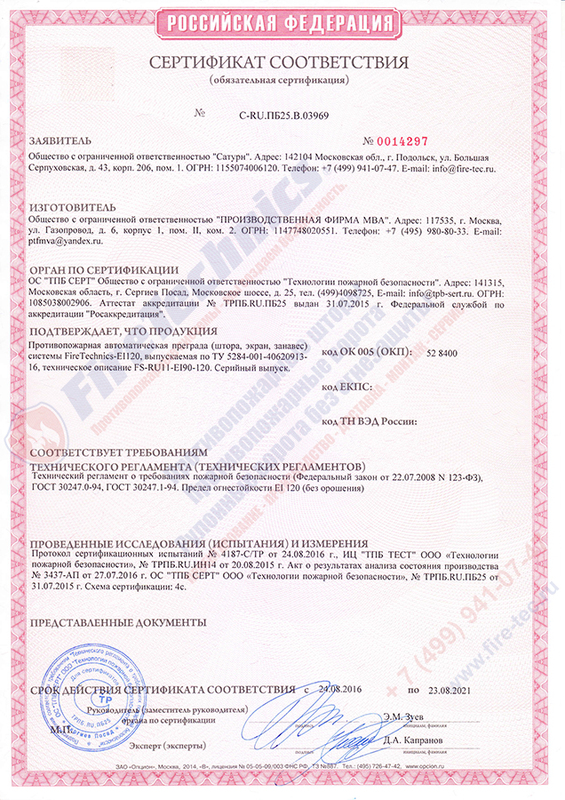 Our trademark (service mark) FireTechnics is protected by the certificate that gives the exclusive right, our group of companies FireTechnics, to prohibit it from being used by other companies. The FireTechnics group of companies has a certificate of compliance with the Quality Management System (ISO 9001: 2008) for the construction of capital construction projects that affect the safety of capital construction projects. 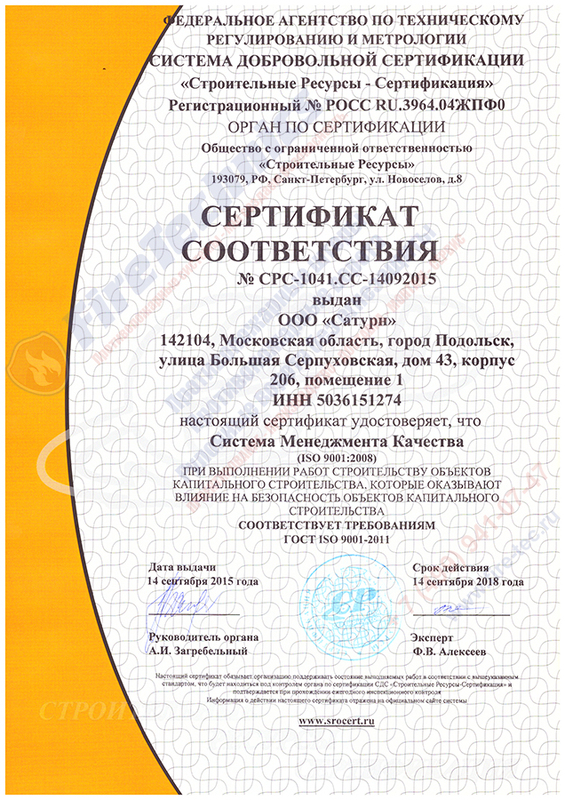 Complies with GOST ISO 9001: 2011. 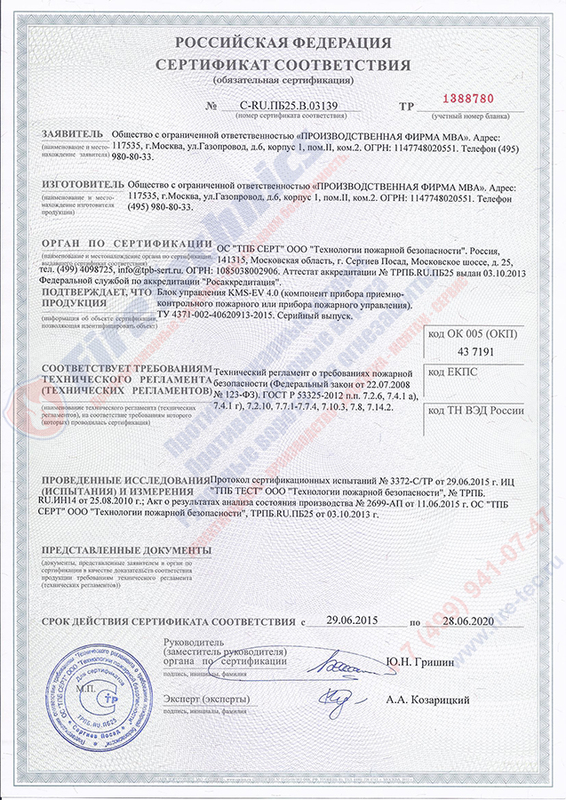 The group of companies FireTechnics at any time will be able to provide licenses, certificates of compliance and permits for the necessary work. 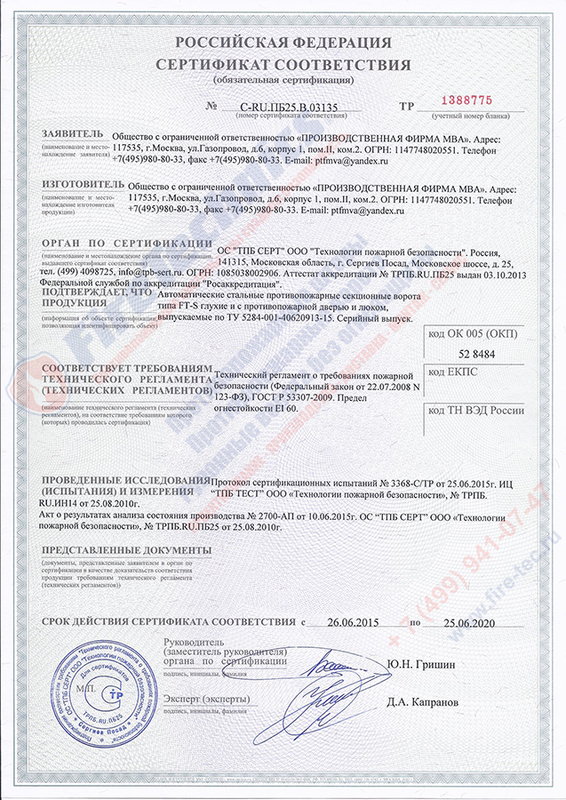 Our company works with the largest construction organizations of the Russian Federation and the CIS, which forces us to possess the necessary documentation and approvals.